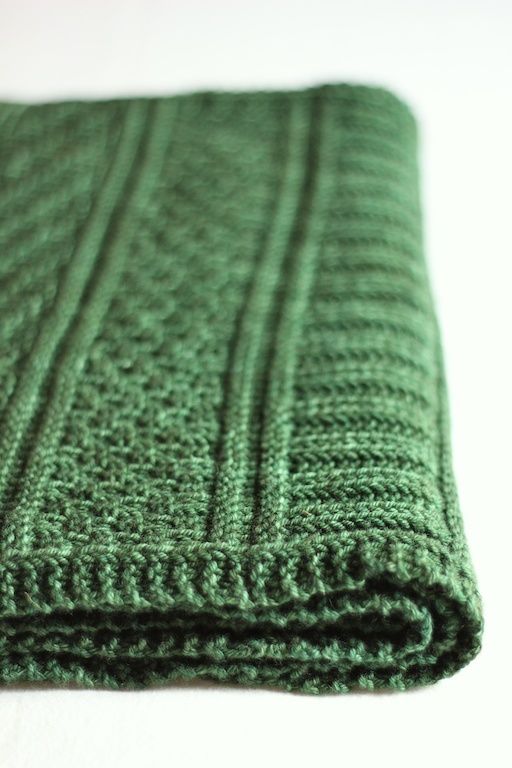 The Guernsey Wrap is finished but – surprise – it’s a different color! When I started this wrap, I began it in Madelinetosh Vintage (a superwash yarn) in Bark, but as I knit it up, I decided I didn’t like the color in that particular pattern. So I ripped it out (you have to be brave when you knit) and ordered a different color for the Guernsey. While I was waiting for that to arrive, I began knitting up the Bark in a different Jared Flood pattern – Autumn Leaves. I so love his patterns. So I knitted half of the Autumn Leaves stole and then the new Madelinetosh showed up and I started the Guernsey Wrap in Moorland. I don’t know why I didn’t like it in the Bark, but it just didn’t look right to me. The pattern calls for casting on 58 stitches but I cast on an extra 12, which is 1 repeat more. In reading a lot of project notes on Ravelry, I felt like a lot of people were not getting quite the width after blocking. 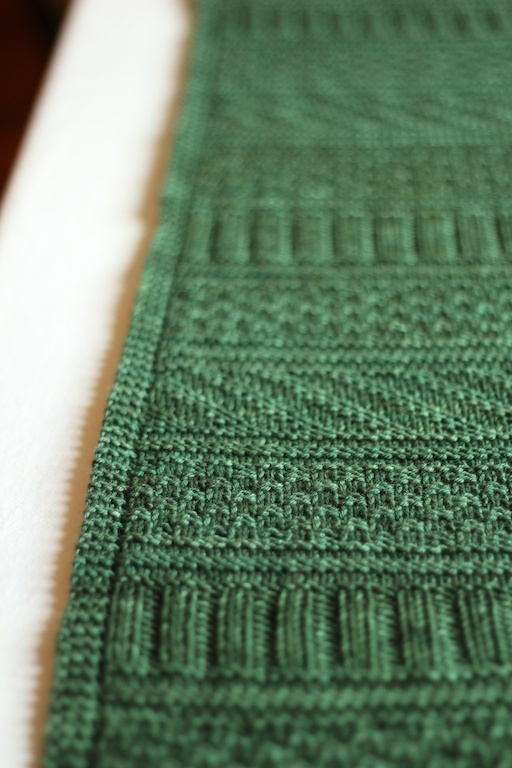 I’m glad I did because even with an extra repeat and fairly aggressive blocking, the wrap is only 16″ wide! I don’t know how the heck Jared got his to 17″ with only 58 stitches. This pattern is very easy. The charts, at first, look daunting because the symbols change every other row – how are you supposed to remember that? Someone on Ravelry said she went through and highlighted all the purl stitches so she could remember. But a few rows into it, I realized you don’t need to do anything like that – if you remember that every single row begins with 3 knit stitches, then you know in that particular row what the knit symbol is going to be. The purls are just the opposite symbol. Easy! Jared recommends a stretchy bind off and so I did Elizabeth Zimmer’s sewn bind off. It was perfectly stretchy and easy to execute. I’m going to post how to do it as a separate follow up to this post. That is BEAUTIFUL!!! I am working on my second knitting project ever and want to build up my confidence to try things like what you made. I am also working on my second ever knitted project. I started knitting with your projects in mind. Thank you for the inspiration. Amy and Joan: You guys made my day! Welcome to the world of knitting! That is stunning!! 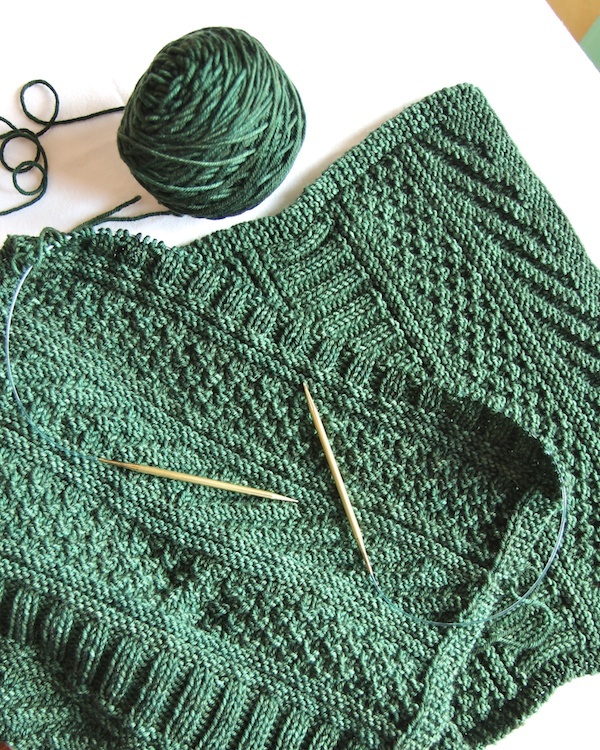 I love the textured stitches of Guernsey styles, so lovely. This is beautiful Elaine! LOVE the color! I MUST learn to knit. I don’t know about Madeline Tosh’s bark colorway, but I have some of the Moorland and it is gorgeous. It looks great in the Guernsey Wrap. This is beautiful! I am enjoying your site; I’m trying more challenges in my knitting and this site is so fun to look at! WOW, this turned out amazing. I love the yarn selection and color choice. I love this color. What a beautiful piece!!! I absolutely love this. After what I think is now a four year break from knitting,because of knitters elbow, I’m thinking of taking it up again just to knit this beautiful throw. Unfortunately I’m also allergic to wool so will have to find a suitable substitute for your beautiful yarn. That is beautiful, and I love the way you photographed it. The texture really comes through! I just ordered the yarn for this same wrap. Yours is gorgeous! 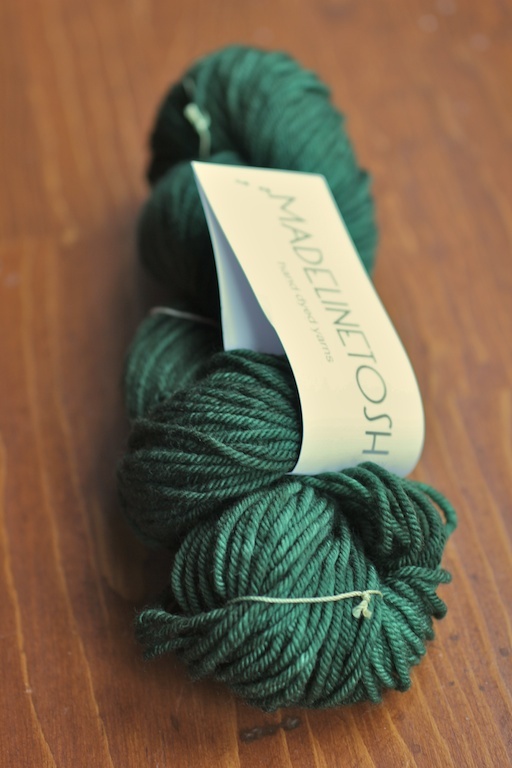 I love the color you chose, and that Madelinetosh yarn is one of my favorites. This is so beautiful! I’m about halfway through my guernsey wrap and really enjoying it. I hope mine turns out as good as yours! Did you wet and block as the pattern suggests? Claire: Yes, I did! I wet blocked and then used blocking pins and wires, like Jared suggests in the pattern. Worked great. I am knitting this in the Brooklyn tweed shelter. How much yarn do you need when you cast on the extra 12 stitches? Thank you! I’m embarrassed to tell you this, but I am the absolute worst person for keeping track of how much yardage I use on a project. Sorry! I couldn’t tell you how much more yarn it takes. Maybe someday I will learn to keep track . . .
Yours looks great and a fantastic color. After three attempts, managed to read all the pattern and finish my wrap in an deep purple. I’ve just got my blocking kit – nervous as it’s the first thing I will have blocked, hoping to follow the instructions in the pattern and have success (thanks for the advice about the possible limits in the width). Looks gorgeous. I started knitting again after twenty years gap. I had wanted to gift a shawl for my daughter. Would you kindly share with me the pattern instructions for this. I am not able to locate it. Thanks . Wow Où estce que je peux avoir le patron? 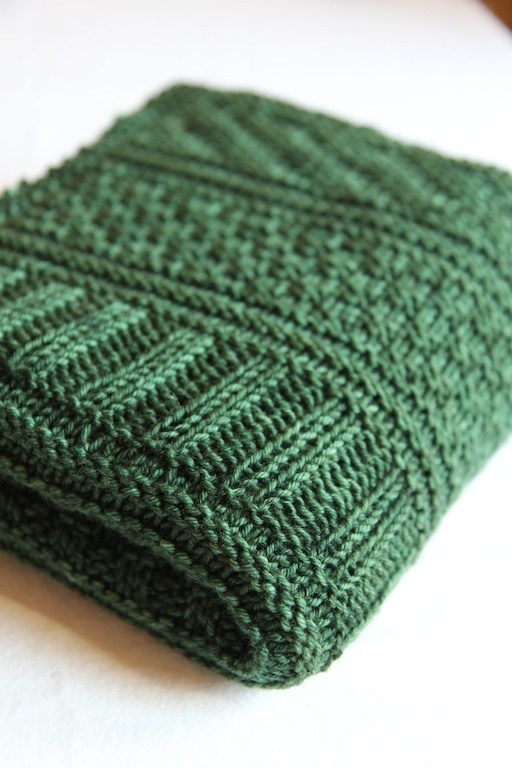 Karine: The link is in the post for the pattern. This is lovely! The link in the post indicates ‘file not found’. Is there another source for this pattern, please? Thanks for letting me know that Dana! Brooklyn Tweed must have changed the product page. I updated the link and you should be able to find it now! Got it! Thanx for the very quick response. is there any reason I couldn’t turn this Guernsey Wrap into an afghan by making it bigger? Also, do you have the pattern written out as opposed to charts? I guess you could make an afghan out of it. The pattern is in charts.